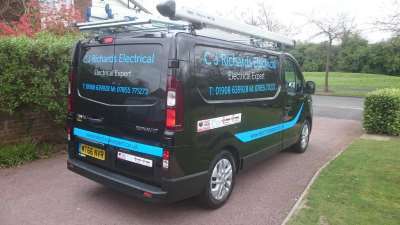 C J Richards Electrical is a leading electrician based in Milton Keynes. We cover the surrounding areas including, Aylesbury, Leighton Buzzard, Bedford, Northampton, Welingbrough and Buckingham. We are a NICEIC approved registered company and in being so we are part of the Compentent Person Scheme introduced by the Government as a one stop protection for consumers to check a trades person or company - See more about this and other insurances on our About Us page. We undertake work in domestic,commercial & industrial enviroments. We are also registered to install domestic electrical installations to comply with Part P of the building regulations. As part of a wide range of electrical services, we have professional expertise in installation testing (landlords, periodic, insurance, emergency lighting & fire alarm') rewires, installations, electrical maintenance, security systems, fire systems & computer networking. Over 25 years in the trade and serving Milton Keynes for 13 years. We can give free quotations and our rates are very competitive. So! If you want a leading specialist in all aspects of electrical services, contact Clive Richards of C J Richards Electrical from Milton Keynes today.